'When the Levees Broke', Spike Lee's comprehensive and definitive third-person documentary of the Hurricane Katrina tragedy, is a damned near-perfect film. Thankfully, Deal and Lessin's film doesn't compete with this, instead offering the ideal companion piece: a uniquely personal ground zero account of the Katrina disaster that goes beyond the harshness of Mother Nature, past the deep-rooted governmental inefficiencies and exposes the bright light of America's spirit of ambition, competitiveness and survival. 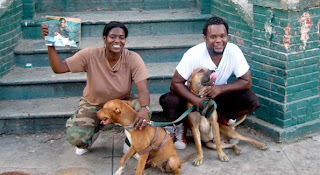 Kimberly Roberts and her husband Scott were invisible to American society before Katrina, a couple of poor, black, struggling, lower status citizens living day-to-day. In August, 2005, before the storm hit, Kimberly, sensing the gravitas of the situation, grabbed their cheap consumer DV Camera and started shooting. And so Rivers, the entrepreneur, opportunist and now documentarian gives us a tour of her near-poverty-stricken Ninth Ward district of New Orleans. When the storm hits we become witness to Mother Nature's aggressive wrath and the heroic acts of ordinary people fighting to survive. As we all know, the storm was only the beginning and Rivers continued to film the sad aftermath, eventually linking up with another documentary crew, who combine and merge their stories into what would become Trouble the Water. Kimberly goes from camera operator to documentary subject and continues to guide us with an astonishing ground level point of view through the absurdities and bewildering, discombobulated bureaucracy that embarrassed America in front of the world. The botched rescue effort is exemplified by the one-on-one conversations with the military personnel who refuse to let the starving and homeless citizens into their base for shelter. Trouble the Water succeeds because of the infectious personality of Ms. Rivers, an affable and candid subject whose anger and fury are tempered with warm Southern charm. But in the end, it's the realization that her steadfast determination to make good on the American dream is what allowed her to survive and make the best of the disaster. The DVD features some worthy deleted and expanded scenes, and offers us a chance to see Kimberly and the filmmakers revel in the success of the film. A Q&A with Richard Roeper at the Roger Ebert Film Festival and a one-on-one meeting with the New Orleans Mayor at the Democratic National Convention show the effect of the documentary on Kimberly and her husband as advocates for social change in the country.